Eastman Guitars might have begun life in 1992 building violins, but if you’ve picked up a copy of this magazine in the last few years, you’ll be well aware that the US company has made serious inroads into the guitar world, offering undeniably cool instruments of a quality and tone that far outstrips their price points. A big part of this bang for buck equation is their Chinese build – something that still has a certain stigma for some, but Eastman has long dispelled this in our eyes. All of Eastman’s guitars are hand-made by luthiers, they just happen to be in Beijing – that’s why they cost more than your average Asian-made guitar, but also why the quality is so impressive. 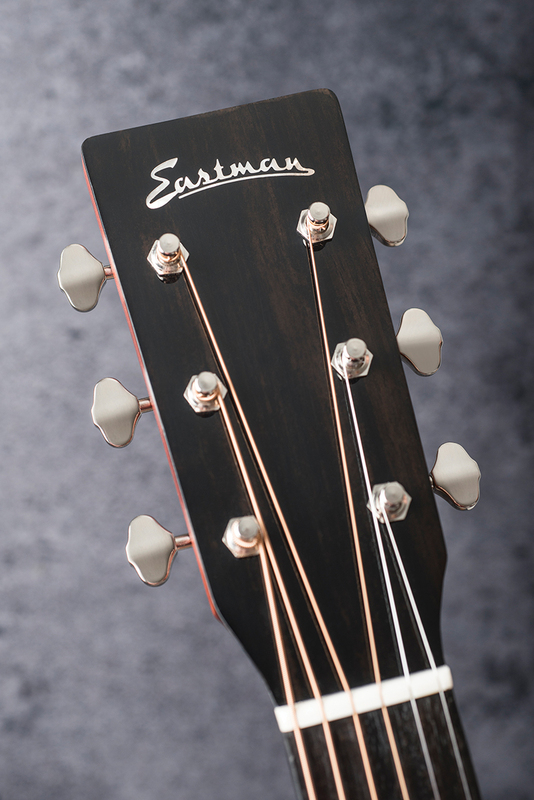 Eastman’s acoustic range is split in two. 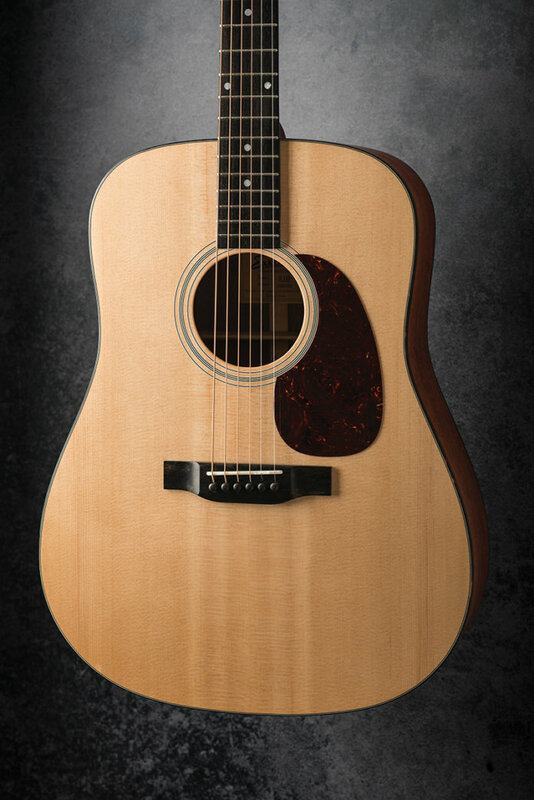 The AC guitars are mid-size cutaways loaded with either Fishman or LR Baggs electronics, while the Traditional series is (as you would expect) full-bodied acoustics in standard body shapes; dreadnought, jumbo, OM and the like. New for 2018 is the E1D from the Traditional series, which is an all-solid dreadnought. If you’re in the market for a new acoustic with £500 to spend, you’re likely going to go down one of two roads. You can either have an electro-acoustic that features a laminate or HPL-type back and sides, or you could go for an all-solid guitar without any electronics. Of course, there are exceptions but generally speaking, omitting the cost of the electronics gives manufacturers room to offer solid tonewoods – which is where the E1D is positioned. There’s not much in the way of decorative embellishments, fancy inlays or ‘bling’. Instead, Eastman has focussed on high quality materials, proving that less can be more. The solid Sitka spruce bookmatched top here is a fine selection and has an almost quilted hue to it. The grain might not be as ruler-straight as on a high-end guitar, but that’s missing the point somewhat. The solid sapele back and sides are also bookmatched, stain-finished and left open-pore. 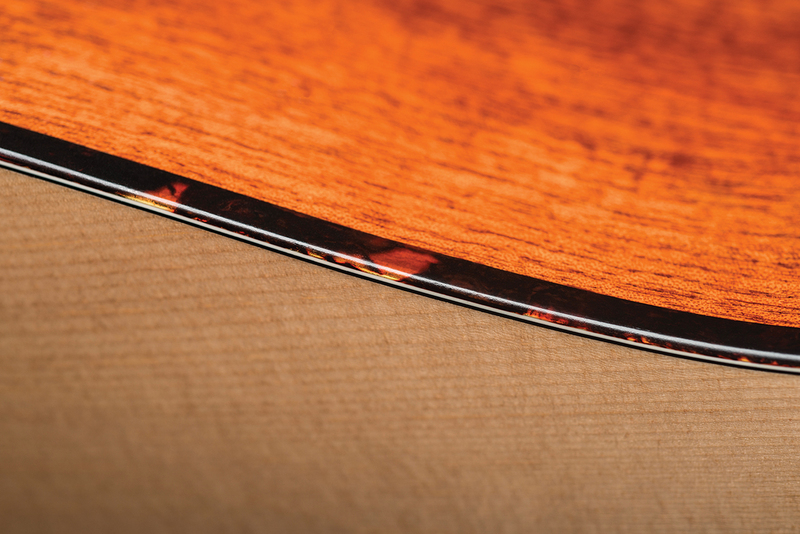 This is where the guitar’s body skips the process where filler is applied to in-fill the wood’s naturally occurring tiny pits and grain marks, leaving what some people refer to as an ‘orange peel’ effect. Open-pore finishes are not just about the aesthetics, the lack of five or six coats of gloss also leaves the wood freer to breathe and it is therefore more resonant. Other materials employed here are ebony for the bridge, bridge pins, headstock veneer and fingerboard, mahogany for the three-piece neck, and bone for the nut and compensated saddle. The body is bound top and bottom with tortoise binding, and the pickguard is tortoiseshell, too. A peek inside reveals a very tidy interior, as well as hand-scalloped X-bracing. 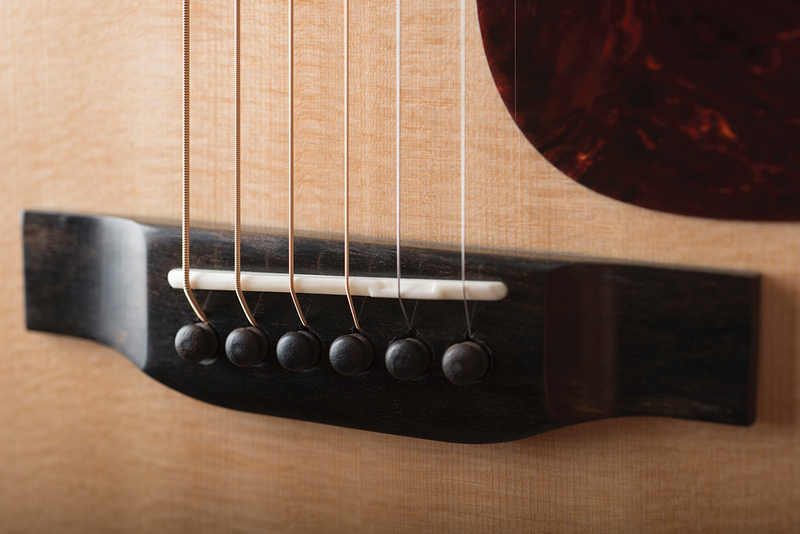 The guitar feels sturdy and robust, and every joint is clean and tight. Putting the E1D through its paces, we’re immediately struck by how loud this guitar is. The projection and volume is remarkable – maybe there’s no need for onboard electronics! Bash away as hard as you wish and the E1D seems to have bags of headroom – at no point did the guitar flinch or begin to reach its limits. 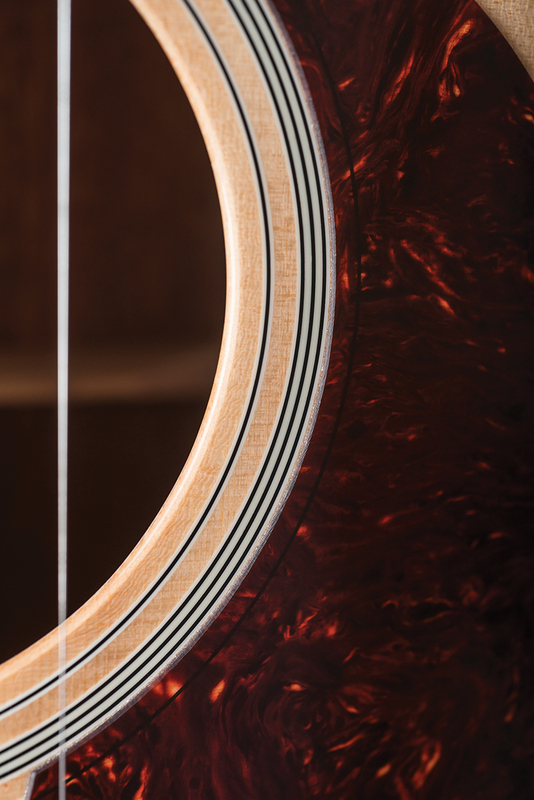 Tonally, the sapele and Sitka spruce pairing combine to produce a recognisable midrange, punchy timbre that would be particularly well-suited as a songwriting tool. Choppy chord work, as well as soloing duties, are all handled admirably, although the lack of a cutaway means solos are prevented from extending too far up the higher reaches of the neck. The E1D is a well-built, all-solid powerhouse of a dreadnought. Its biggest challenge is how heavily populated this price point is. 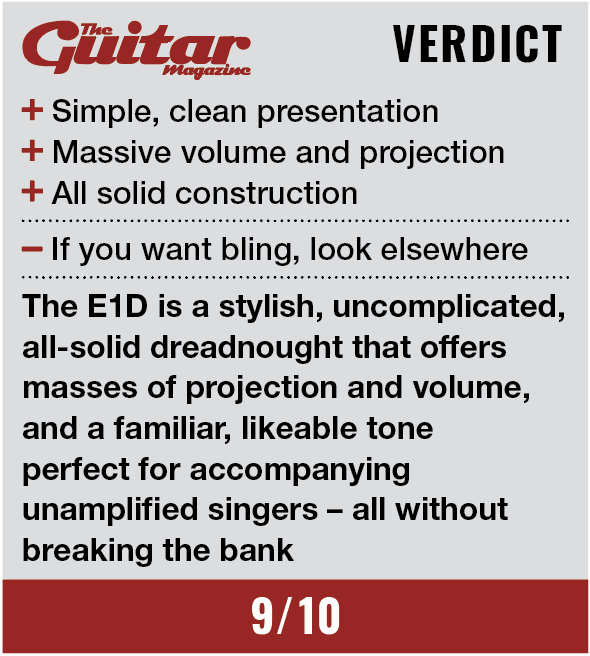 Consumers with £500 to spend on an acoustic have a wealth of choices, but the E1D has enough about it to make it stand out from the crowd.